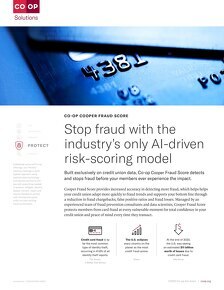 COOPER is the data-driven "brain" inside of CO-OP, designed to detect and fight fraud on behalf of our credit union clients faster than ever before. COOPER Fraud Analyzer uses rules and decisioning to instantly identify potentially fraudulent transactions. With each incident, the details of the transaction get fed back into our database so COOPER can “learn” from the experience, adding yet another layer of intelligence to the system. 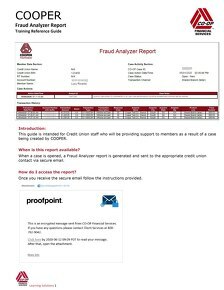 Click on the resources below to learn more about COOPER, machine learning and how to integrate COOPER Fraud Analyzer into your credit union’s fraud defense processes. If at any time you would like support or have questions not answered by the documents included in the toolkit, you may email clientcare@coop.org. The content on this site is meant for Credit Unions and State Network Partners utilizing one or more of the following CO-OP Shared Branching channel products: CO-OP Mobile, Sprig, Shared Branch Express ATM/Kiosk, Shared Branch Teller (in branch), CO-OP Contact Center or Remote Deposit Capture. 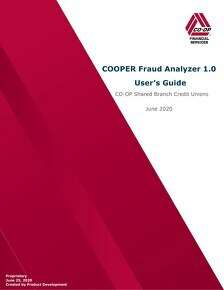 In order to participate in COOPER Fraud Analyzer, each credit union must provide contacts who will help verify suspicious transactions. Fraud contact information can be submitted by emailing CO-OP's Account Fraud Detection team at accountfrauddetection@coop.org.